6772. Helen King WILLIAMS 1, 2 (Edwin Gex Whitesel WILLIAMS , Anna Cathryn WHITESELL , Emily Elizabeth BITLER , Samuel , Michael , Johannes ) was born on 14 Feb 1929 in Fort Lauderdale, Broward, FL. She died on 16 Oct 2009 in Fort Lauderdale, Broward, FL. Helen graduated from Fort Lauderdale High School in 1947 in Fort Lauderdale, Broward, FL. She resided in Mar 1948 in Fort Lauderdale, Broward, FL. She graduated with Business degree from University of Miami. She was a member of First Presbyterian Church in Fort Lauderdale, Broward, FL. She resided in Wilton Manors, Broward Co, FL. Helen married Hon. George RICHARDSON Jr. [scrapbook] 1, 2, son of George RICHARDSON Sr and Rachel HAYES, about 1953. George was born on 31 Dec 1918 in Rydal, Montgomery Co, PA. He died on 31 Jul 2009 in Wilton Manors, Broward, FL. George resided in 1936 in Wilton Manors, Broward Co, FL. He served in the military with U.S. Army - Second Lieutenant (3.5 yrs) in South Pacific. He worked as lawyer in 1951. He worked as judge. He graduated from University of Miami School of Law. He was a member of Wilton Manors City Council (President & Council Member). He worked as attorney with City of Wilton manors (2 terms). He worked as Broward County Circuit and County Judge (16 yrs). He was a member of Wilton Manors Civil Service Board (Chairman). He was a member of Broward County Charter Review Commission. He was a member of Broward County Planning Council. He was a member of Insight for the Blind (board member and past president). He was a member of Florida Bar Association (50 yr member). He was a member of First Presbyterian Church. He was a member of Lauderdale Yacht Club (Commodore), Restless Weasel's group. + 12066 F i Kathryn Rachel "Kamie" RICHARDSON. + 12067 M ii George RICHARDSON III. + 12068 M iii Gex Franklin RICHARDSON Esq. 6774. Samuel Thomas RIEGLE [scrapbook] 1, 2, 3 (George Washington RIEGLE , Samuel B RIEGLE , Sarah BITLER , Samuel , Michael , Johannes ) was born on 12 Mar 1868 in Darke Co, OH. He died on 20 Oct 1927 in Liberty Twp, Darke Co, OH. He was buried on 22 Oct 1927 in Greenmound Cemetery, New Madison, Harrison Twp, Darke Co, OH. 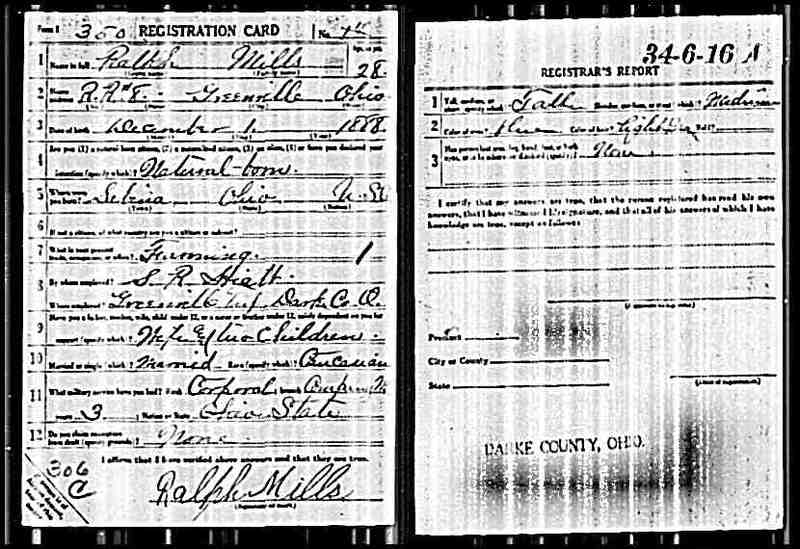 Samuel resided in 1900 in German Twp, Darke Co, OH. He worked as Farmer in 1900. He resided in 1910 in German Twp, Darke Co, OH. He worked as Farmer - General Farm in 1910. He resided in 1920 in Liberty Twp, Darke Co, OH. He worked as Farmer - General Farm in 1920. 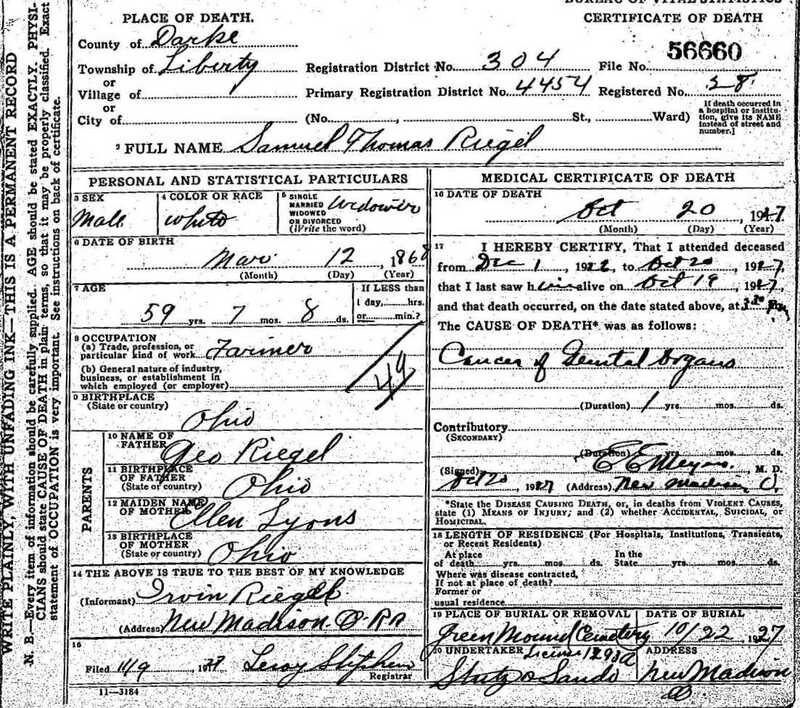 He resided in Oct 1927 in Liberty Twp, Darke Co, OH. He worked as Farmer in Oct 1927. Samuel married Sadie Vitelia EDGER [scrapbook] 1, 2, 3, daughter of George EDGER and Mary Ann LINDEMUTH, on 30 May 1890 in Liberty Twp, Darke Co, OH. Sadie was born on 3 Feb 1869 in Near Bethel, Randolph Co, IN. She died on 17 Sep 1925 in Harrison Twp, Darke Co, OH. She was buried on 20 Sep 1925 in Greenmound Cemetery, New Madison, Harrison Twp, Darke Co, OH. Sadie resided in 1900 in German Twp, Darke Co, OH. She resided in 1910 in German Twp, Darke Co, OH. She resided in 1920 in Liberty Twp, Darke Co, OH. The cause of her death was Liver Cancer. + 12069 M i George Irvin "Ervin G" RIEGLE was born on 3 May 1891. He died on 27 Oct 1961. + 12070 M ii Charles Handy "Handy" RIEGLE was born on 19 Jul 1895. He died on 8 Dec 1977. 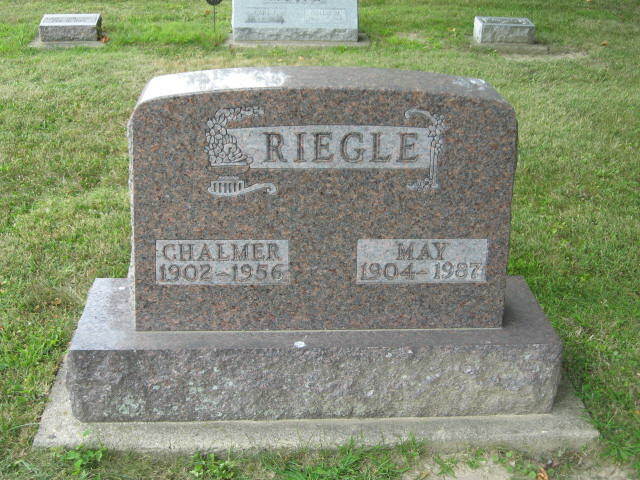 Chalmer Theodore RIEGLE [scrapbook] 1, 2 was born on 3 Jun 1902 in Liberty Twp, Darke Co, OH. He died on 28 Sep 1956 in Wayne Hospital, Greenville, OH. He was buried in Greenmound Cemetery, Harrison Twp, Darke Co, OH. Chalmer resided in 1910 in German Twp, Darke Co, OH. He resided in 1920 in Liberty Twp, Darke Co, OH. He worked as Farm Labor - Home Farm in 1920. Chalmer also married May ROYER [scrapbook], daughter of Rufus R ROYER and Bertha Vinora FRY, on 23 Feb 1926. May was born on 1 Jan 1904 in Liberty Twp, Darke Co, OH. She died in Liberty Twp, Darke Co, OH. She was buried in Greenmound Cemetery, Harrison Twp, Darke Co, OH. May resided in 1920 in Liberty Twp, Darke Co, OH. + 12072 M iv Orla Edward RIEGLE was born on 10 Oct 1907. He died on 1 Jan 2007. 6777. Charles Jeptha RIEGLE [scrapbook] 1, 2 (George Washington RIEGLE , Samuel B RIEGLE , Sarah BITLER , Samuel , Michael , Johannes ) was born on 1 Jun 1876/1877 in Darke Co, OH. He died on 17 Jul 1934 in Butler Twp, Darke Co, OH. He was buried on 20 Jul 1934 in Ft Jefferson Cemetery, Darke Co, OH. Charles married Ida Ellen WRIGHT [scrapbook] 1, 2, daughter of Edward Henry WRIGHT and Allettah DUNN. Ida was born on 8 Mar 1873 in Adams Twp, Darke Co, OH. 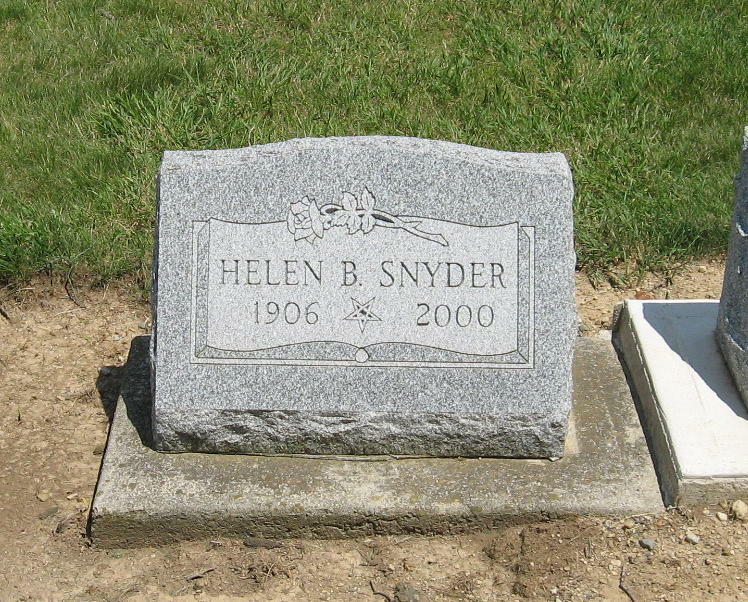 She died on 4 Apr 1928 in Neave Twp, Darke Co, OH. She was buried on 6 Apr 1928 in Ft Jefferson, Darke Co, OH. + 12073 F i Virginia E RIEGLE was born on 20 Aug 1900. She died on 9 Jun 1984. 12074 F ii Mildred H RIEGLE. 6780. James Roy RIEGLE [scrapbook] 1 (George Washington RIEGLE , Samuel B RIEGLE , Sarah BITLER , Samuel , Michael , Johannes ) was born on 4 May 1883 in Darke Co, OH. He died on 8 May 1953 in Greenville, Darke Co, OH. He was buried on 11 May 1953 in Greenville Cemetery, Darke Co, OH. James resided in 1900 in Neave Twp, Darke Co, OH. He was issued a social security number . He resided in May 1953 in 418 Warren St, Greenville, Darke Co, OH. He worked as Laborer - Custodian in May 1953. James married Jessie Merle SHULTZ 1 on 21 Feb 1908 in Darke Co, OH. Jessie was born on 5 May 1890 in Darke Co, OH. She died on 23 Jul 1964 in Darke Co, OH. She was buried in Greenville, Darke Co, OH. + 12075 F i Dorothy Isabel RIEGLE was born on 12 Oct 1909. She died on 16 Nov 1992. + 12076 M ii Robert Lee RIEGLE was born on 12 Jan 1912. He died in Sep 1968. + 12077 F iii Lily Bel Pearl RIEGLE. + 12078 M iv James Virgil RIEGLE. + 12079 F v Elsie Evelyn RIEGLE. + 12080 F vi Kathryn Elizabeth RIEGLE. + 12081 M vii William Elmer RIEGLE was born on 8 Nov 1919. He died on 23 May 1960. + 12082 M viii Christian V RIEGLE was born on 26 Oct 1920. He died on 29 Nov 1989. + 12083 M ix Donald Merle RIEGLE. + 12084 F x Helen Joan RIEGLE. + 12085 F xi Betty Lourine RIEGLE. + 12086 F xii Phyllis Joy RIEGLE. + 12087 F xiii Mary Jane RIEGLE. 6783. Clara Rebecca RIEGLE 1, 2 (George Washington RIEGLE , Samuel B RIEGLE , Sarah BITLER , Samuel , Michael , Johannes ) was born on 8 Aug 1890 in Darke Co, OH. She died in Jul 1979 in Greenville, Darke Co, OH. Clara resided in 1900 in Neave Twp, Darke Co, OH. She resided in 1910 in German Twp, Darke Co, OH. She resided in 1920 in Harrison Twp, Darke Co, OH. She resided in 1930 in Bradford, Newberry Twp, Miami Co, OH. She resided in May 1936 in Greenville, Darke Co, OH. Clara married Benjamin Harrison ROSS 1, son of E P ROSS, on 9 Jan 1909 in Darke Co, OH. Benjamin was born on 30 Jun 1888 in Randolph Co, IN. He died on 19 Feb 1968 in Darke Co, OH. Benjamin resided in 1910 in German Twp, Darke Co, OH. He worked as Farmer - Farm in 1910. He resided in 1920 in Harrison Twp, Darke Co, OH. He worked as Farmer - General Farm in 1920. He resided in 1930 in Bradford, Newberry Twp, Miami Co, OH. He worked as Car Inspector - Pensylvania Railroad in 1930. + 12088 M i Robert Russell ROSS was born on 2 Dec 1909. He died on 28 May 1976. 12089 F ii Marjorie Helen ROSS. 6784. 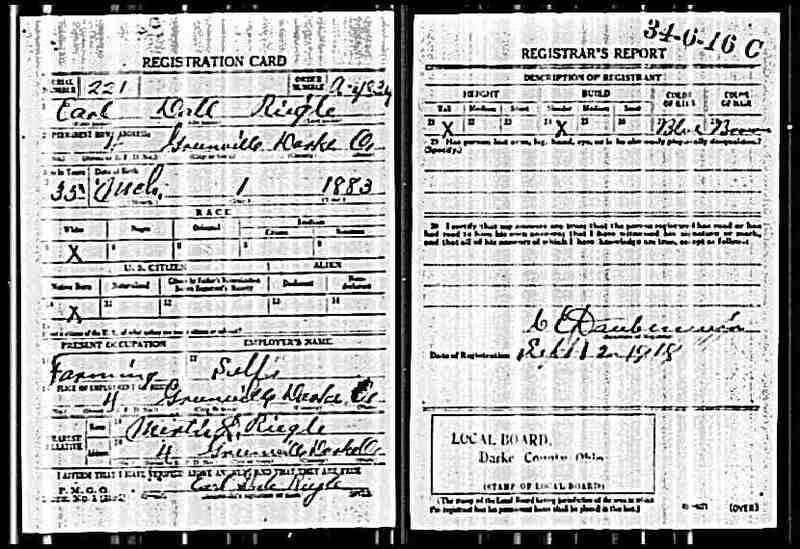 Grace E ALBRIGHT 1 (Susan E RIEGLE , Samuel B RIEGLE , Sarah BITLER , Samuel , Michael , Johannes ) was born on 14 Jan 1881 in Darke Co, OH. She died on 2 Aug 1962 in Darke Co, OH. Grace was a member in 1900 in 105 North St, Arcanum, Twin Twp, Darke Co, OH. She worked as At School in 1900. She resided in 1910 in 1001 Fifth St, Columbus, Bartholomew Co, IN. She resided in 1930 in 1511 Washington St, Columbus, Bartholomew Co, IN. Grace married Frank JONES 1 about 1904. Frank died before 1910. Helen JONES 1 died before 1910. + 12091 M ii Harold A JONES was born on 4 Oct 1904. He died on 3 Mar 1970. Grace also married George A WISE 1 on 8 Mar 1911 in Darke Co, OH. George resided in 1930 in 1511 Washington St, Columbus, Bartholomew Co, IN. He worked as Cabinet Maker - Funritue Factory in 1930. 12092 M iii Roy Samson WISE. 12093 M iv Earnest A WISE. 12094 F v Grace Harriet WISE. Leonard L WISE 1 was born on 1 Sep 1919 in Darke Co, OH. He died on 24 Sep 1991 in Columbus, IN. Leonard resided in 1930 in 1511 Washington St, Columbus, Bartholomew Co, IN. 6789. Opal RIEGLE [scrapbook] 1, 2 (William Henry Harrison RIEGLE , Samuel B RIEGLE , Sarah BITLER , Samuel , Michael , Johannes ) was born on 6 Feb 1884 in Darke Co, OH. She died in 1965. She was buried in Abbottsville Cemetery, Greenville, Darke Co, OH. Opal resided in 1930 in Van Buren Twp, Darke Co, OH. She resided in 1940 in Monroe Twp, Darke Co, OH. Opal married Charles T FOUREMAN [scrapbook] 1, 2 on 6 Jan 1904 in Darke Co, OH. 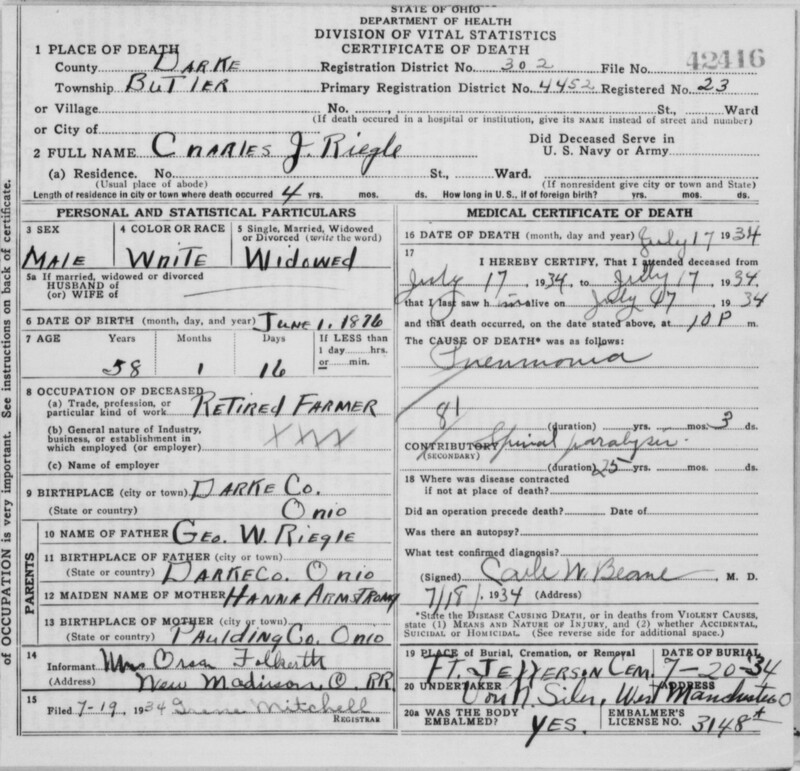 Charles was born in 1880 in Darke Co, OH. He died in 1958. He was buried in Abbottsville Cemetery, Greenville, Darke Co, OH. Charles resided in 1930 in Van Buren Twp, Darke Co, OH. He worked as Laborer - General Farm in 1930. He resided in 1940 in Monroe Twp, Darke Co, OH. He worked as farmer - farm in 1940. Pauline FOUREMAN 1, 2 was born about 1905 in OH. She died before 2011. Helen L FOUREMAN [scrapbook] 1, 2 was born on 28 Jun 1906 in Darke Co, OH. She died on 20 Oct 2000 in Greenville, Darke Co, OH. She was buried in Sec 18/19, Abbottsville Cemetery, Abbottsville, Darke Co, OH. 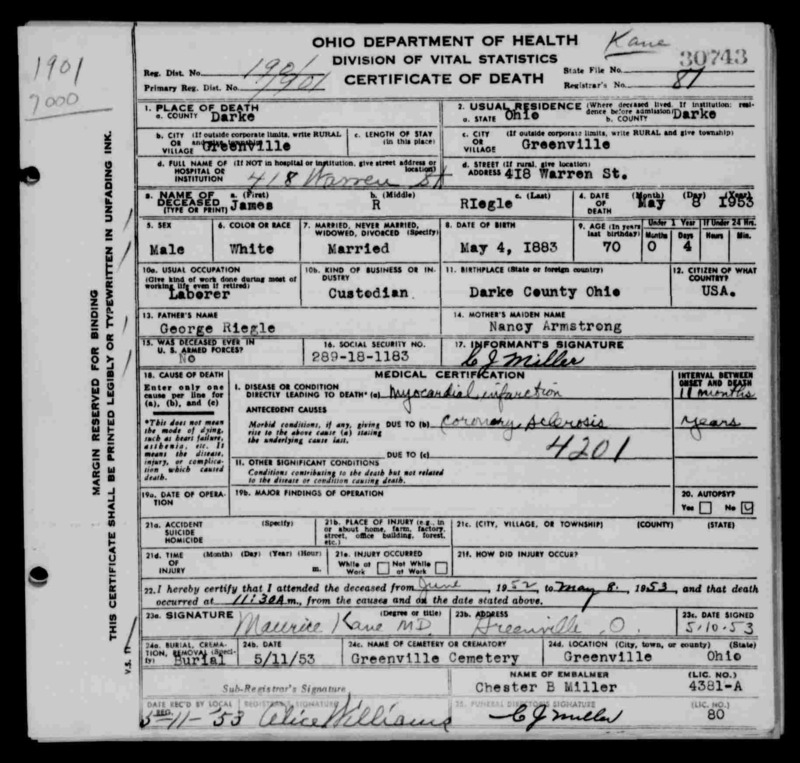 Helen resided in 1930 in Van Buren Twp, Darke Co, OH. She worked as Seamstress - Athletic Factory in 1930. Helen married Herman Kenneth BAKER in 1932. Herman was born on 20 May 1912 in Darke Co, OH. He died on 27 Oct 1999 in Greenville, Darke Co, OH. + 12098 F iii Dorothy J FOUREMAN was born on 26 Apr 1911. She died on 27 Aug 1996. 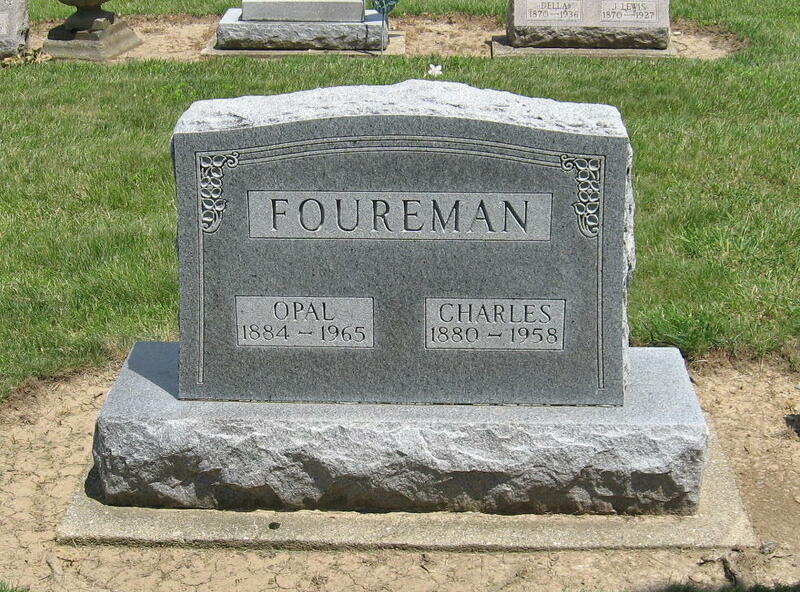 Burman W FOUREMAN 1, 2 was born on 31 Jul 1914 in OH. He died on 29 Dec 1992 in Greenville, Darke Co, OH. Burman resided in 1930 in Van Buren Twp, Darke Co, OH. He was issued a social security number before 1951 in OH. + 12100 M v Gerald C FOUREMAN was born on 26 Mar 1921. He died on 8 Jul 2011. 6791. Earl Dale RIEGLE [scrapbook] 1 (Daniel Webster RIEGLE , Samuel B RIEGLE , Sarah BITLER , Samuel , Michael , Johannes ) was born on 1 Mar 1883 in Neave Twp, Darke Co, OH. He died on 1 Jun 1966 in Wayne Hospital, Greenville, Darke Co, OH. Earl resided in Sep 1918 in Rt 4, Greenville, Darke Co, OH. He worked as Farming in Sep 1918. He resided in 1920 in Washington Twp, Darke Co, OH. He worked as Farming - General Farm in 1920. He resided in 1930 in Washington Twp, Darke Co, OH. He worked as Farmer - General Farm in 1930. He resided in 1942 in Washington Twp, Darke Co, OH. He worked as Farmer in 1942. Earl married Mertie Lecta WILLIAMSON 1, daughter of Mellissa. Mertie was born on 27 Aug 1888 in Darke Co, OH. She died in Sep 1968 in Darke Co, OH. 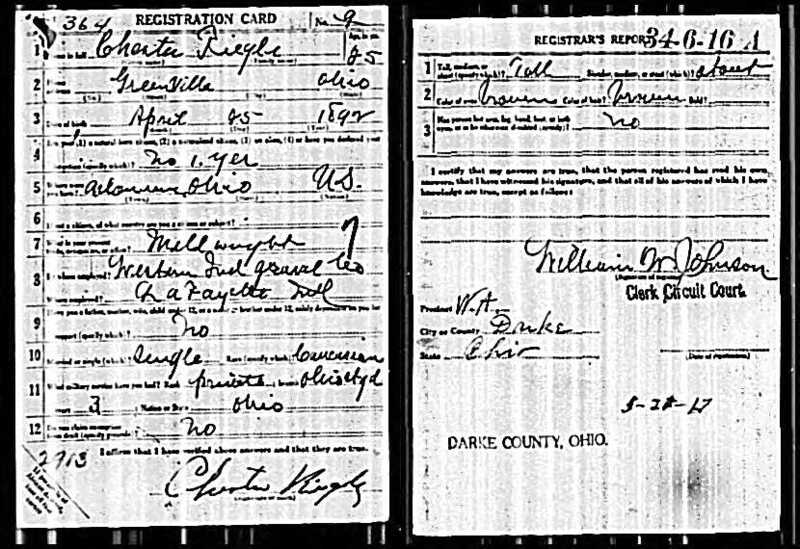 Mertie resided in 1920 in Washington Twp, Darke Co, OH. She resided in 1930 in Washington Twp, Darke Co, OH. She resided in 1942 in Washington Twp, Darke Co, OH. + 12101 F i Elva Aileen RIEGLE was born on 7 Aug 1907. She died in 1936. 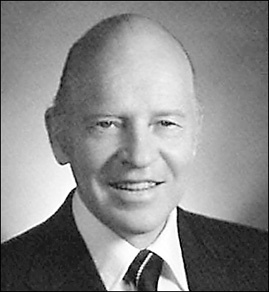 Glen Dale RIEGLE 1 was born on 16 Mar 1909 in Washington Twp, Darke Co, OH. He died on 6 Feb 1936 in Ohio Hospital For Epileptics, Gallipolis, Gallia Co, OH. He was buried in Feb 1936 in Memorial Cemetery, Darke Co, OH. Glen resided in 1920 in Washington Twp, Darke Co, OH. He resided in 1930 in Washington Twp, Darke Co, OH. He worked as Laborer - Odd Jobs in 1930. The cause of his death was Acute Appendicitis. + 12103 F iii Mary Melissa RIEGLE was born on 21 Feb 1911. She died in Feb 1987. + 12104 F iv Bernice June RIEGLE was born on 5 Jan 1920. She died on 18 Aug 2008. + 12105 M v Lawrence Dean RIEGLE was born on 6 Apr 1923. He died on 12 Feb 1998. + 12106 M vi Delbert Williamson RIEGLE. 6795. Chester RIEGLE [scrapbook] 1, 2 (Daniel Webster RIEGLE , Samuel B RIEGLE , Sarah BITLER , Samuel , Michael , Johannes ) was born on 25 Apr 1892 in Van Buren Twp, Darke Co, OH. He died on 27 Sep 1957 in Darke Co, OH. He was buried in Abbotsville Cemetery, Abbotsville, Darke Co, OH. Chester resided in 1910 in Greenville Twp, Darke Co, OH. He worked in 1910 in Laborer - Working Out. He served in the military with Indiana, Corporal, 22 Engineers in WW I. He resided in 1930 in 423 S First St, Lafayette, Tippecanoe Co, IN. He resided in 1940 in 1500 S Fourth St, Lafayette, Tippecanoe Co, IN. He worked as superintendent - gravel company in 1940. Chester married Cecilia M SHANK 1, 2 on 2 May 1918 in Tippecanoe Co, IN. Cecilia was born on 25 Aug 1892 in IN. She died in Sep 1970 in Cincinnati, Hamilton Co, OH. Cecilia resided in 1930 in 423 S First St, Lafayette, Tippecanoe Co, IN. She resided in 1940 in 1500 S Fourth St, Lafayette, Tippecanoe Co, IN. Chester Francis RIEGLE 1, 2 was born on 19 Aug 1920 in IN. He died on 17 Jan 1997. Chester resided in 1930 in 423 S First St, Lafayette, Tippecanoe Co, IN. He resided in 1940 in 1500 S Fourth St, Lafayette, Tippecanoe Co, IN. He was issued a social security number before 1951 in IN. He served in the military with U.S. Navy from 2 Apr 1951 to 8 May 1954. Margaret RIEGLE 1, 2 was born about 1923 in IN. She died before Jun 2006. Margaret resided in 1930 in 423 S First St, Lafayette, Tippecanoe Co, IN. She resided in 1940 in 1500 S Fourth St, Lafayette, Tippecanoe Co, IN. She worked as secretary - research? in 1940. Marry Lillis RIEGLE 1, 2 was born about 1924 in IN. She died before Jun 2006. Marry resided in 1930 in 423 S First St, Lafayette, Tippecanoe Co, IN. She resided in 1940 in 1500 S Fourth St, Lafayette, Tippecanoe Co, IN. + 12110 M iv William J RIEGLE was born on 19 Jul 1924. He died on 26 Jun 2006. Jane Marie RIEGLE 1 was born on 26 Jul 1925 in IN. She died on 31 Oct 2002 in Montgomery, Hamilton Co, OH. Jane resided in 1930 in 423 S First St, Lafayette, Tippecanoe Co, IN. She resided in 1940 in 1500 S Fourth St, Lafayette, Tippecanoe Co, IN. She resided in Oct 2002 in Silverton, Hamilton Co, OH. Jane married William John KIBLER. 12112 M vi Robert RIEGLE. 6796. 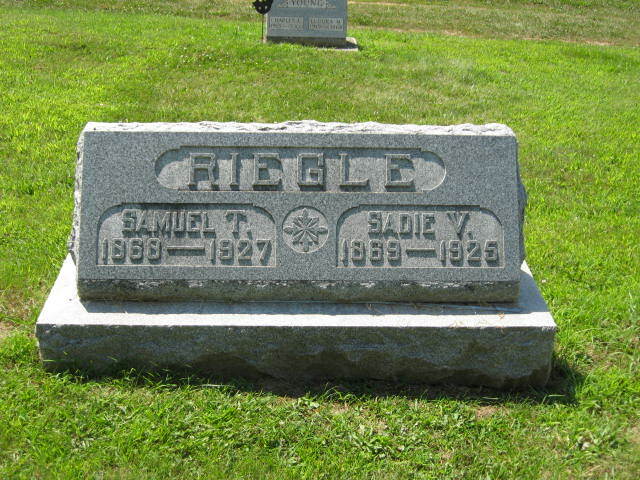 Inez J RIEGLE 1 (Daniel Webster RIEGLE , Samuel B RIEGLE , Sarah BITLER , Samuel , Michael , Johannes ) was born on 1 Apr 1895 in Van Buren Twp, Darke Co, OH. She died in Jul 1969 in Portland, Jay Co, IN. Inez resided in 1910 in Greenville Twp, Darke Co, OH. She resided in 1920 in Greenville Twp, Darke Co, OH. She resided in 1930 in 315 Anderson Ave, Greenville, Darke Co, OH. Inez also married Ralph M MILLS [scrapbook] 1 on 14 Feb 1912 in Darke Co, OH. Ralph was born on 1 Dec 1887 in Clinton Co, OH. He died on 9 Oct 1961 in Wayne Hospital, Greenville, Darke Co, OH. Ralph resided in 1920 in Greenville Twp, Darke Co, OH. He worked as Farmer - Dairy Farm in 1920. He resided in 1930 in 315 Anderson Ave, Greenville, Darke Co, OH. He worked as Laborer - Odd Jobs in 1930. 12113 M i Raymond MILLS. 12114 M ii Forrest MILLS. 12115 M iii Bernard MILLS. 12116 M iv Doyle MILLS. 6797. Onda E RIEGLE 1 (Daniel Webster RIEGLE , Samuel B RIEGLE , Sarah BITLER , Samuel , Michael , Johannes ) was born on 10 Mar 1898 in Greenville, Darke Co, OH. She died on 29 May 1961 in Dayton, Montgomery Co, OH. Onda resided in 1910 in Greenville Twp, Darke Co, OH. She resided in 1930 in 233 College Park Ave, Dayton, Montgomery Co, OH. Onda married Raymond L DANCER 1 about 1927 in OH?. Raymond was born about 1902 in OH. Raymond resided in 1930 in 233 College Park Ave, Dayton, Montgomery Co, OH. He worked as Machinist - Cash Register in 1930. 12117 M i Gary DANCER. 12118 F ii Donna Jean DANCER. 6798. Lillis G RIEGLE 1 (Daniel Webster RIEGLE , Samuel B RIEGLE , Sarah BITLER , Samuel , Michael , Johannes ) was born on 6 Oct 1901 in Darke Co, OH. She died in Apr 1981 in Bradenton, FL. Lillis resided in 1910 in Greenville Twp, Darke Co, OH. 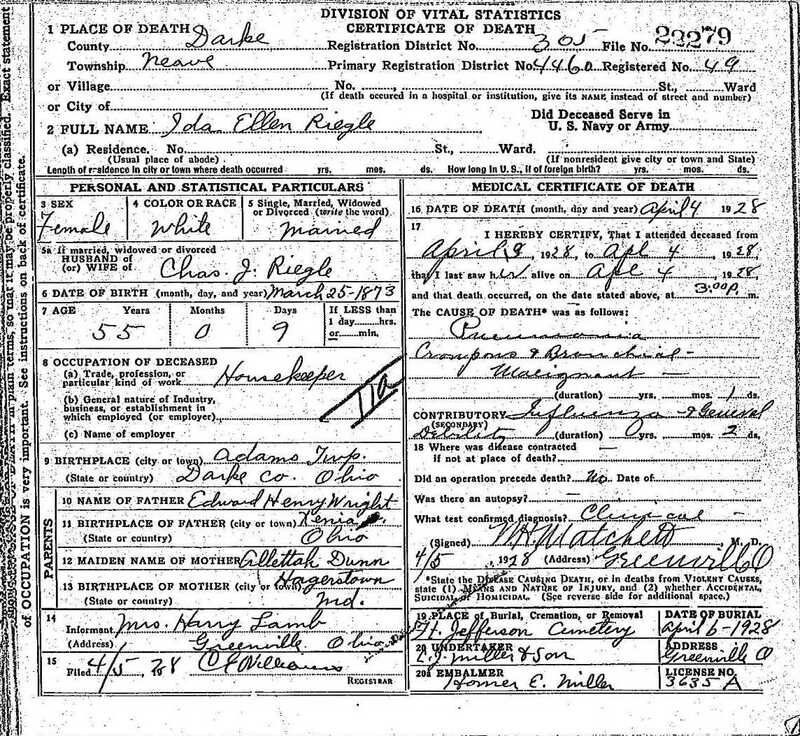 Lillis married Robert L HOLMES 1 on 1 Apr 1922 in Darke Co, OH. Robert was born on 25 Jan 1900 in Darke Co, OH. He died in Mar 1989 in Winter Park, FL. 12119 M i William HOLMES.